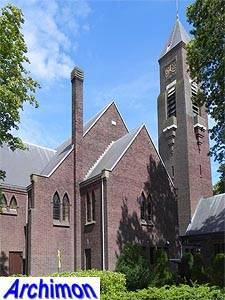 Gijsbertus van Hoogevest, more often called Gijs, was born in Amersfoort on March 24th 1887 as the son of a carpenter. He was educated at the Quellinusschool in Amsterdam for crafts founded by P.J.H. Cuypers. 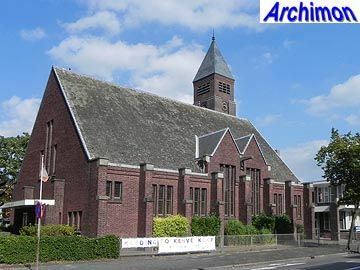 In 1909 Van Hoogevest graduated as an architectural overseer and founded an office in his home town. He designed numerous buildings, including houses, schools, offices and, eventually, reformed churches. 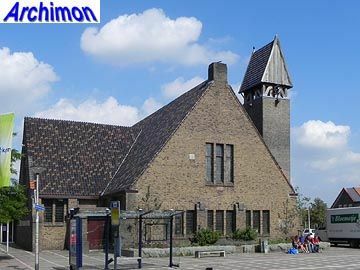 His first known work is for a protestant primary school in De Bilt (U). 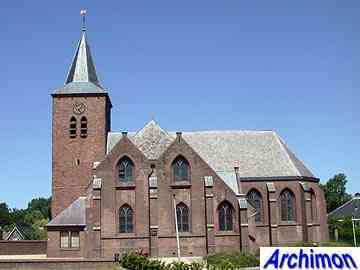 His first work in the field of church architecture was probably the restoration of the old church of Zetten (G), which he extended in Neo-Gothic style in 1911-1912. His earliest designs for churches were in Rationalist style, inspired by architects H.P. 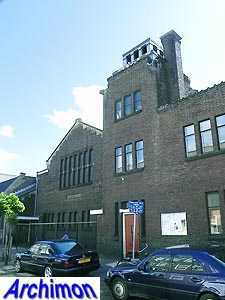 Berlage and K.P.C. de Bazel. This style was sometimes combined with Expressionism, while some designs are in the latter style completely. In ca. 1934 he switched to Traditionalism. 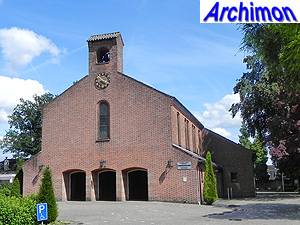 In 1943 he was joined by his son Teus van Hoogevest (1915-2005), who took over the office in 1953 and designed a further twelve churches, while restoring many more, as well as.numerous other historic buildings Teus was himself succeeded by his own son Gijsbert (1951-). Gijs van Hoogevest died in Ermelo on September the 21st 1968. The nave of a medieval church is replaced by a new one with on the south side a wide and tall side-aisle in neo-Gothic style. Also, the outer bricks of the choir are replaced by new ones. 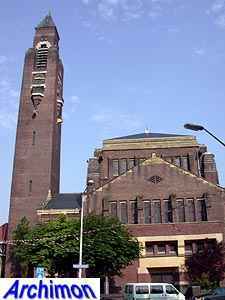 Big centralizing church in Rationalist style, with tall tower. Ground plan in the shape of a Greek cross. Church in Expressionist style with the tower at the back, designed in conjuction with H.A. Pothoven, who took care of the interior. Church in Expressionist style. 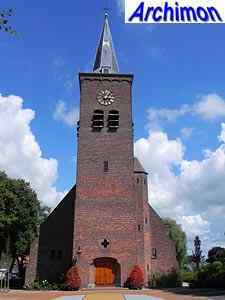 The tower at the back is a smaller version of the tower of the Julianakerk in Den Haag. Small church in Expressionist style. Built using irregular shaped yellow bricks. Included the widening of the nave with a transept in Neo-Gothic style. 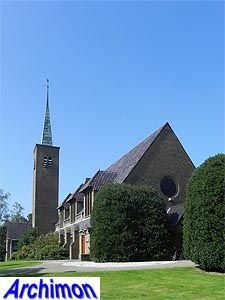 Cruciform church in simple Expressionist style, with tower in the corner of two arms. 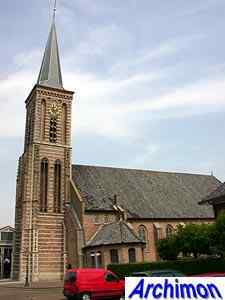 Church in combination of Traditionalism and Expressionism, with at the back a tower with tall spire. Aisleless church in Expressionist style, with tower in Traditionalist style. Van Hoogevest also designed several other parts of this complex. 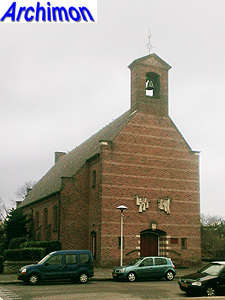 Chapel in Traditionalist style, with big buttresses and a tower identical to the one of the Jeruzalemkerk in Zwolle. Church in Traditionalist style, with big buttresses and a tower next to the side at the back. Addition of a north wing to a church built in 1796. 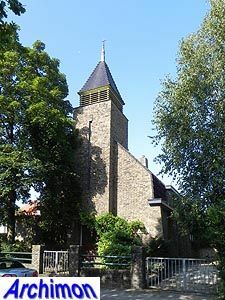 Church in Traditionalist style, with a tower at the back. Three-aisled church in Traditionalist style without tower. Church in Traditionalist style, inspired by Gothic, incorporating a Gothic tower. Pseudo-basilican church in Traditionalist style. Three-aisled church in Traditionalist style without tower. Basilican construction with large windows in the clerestorey and small ones in the side-aisles. 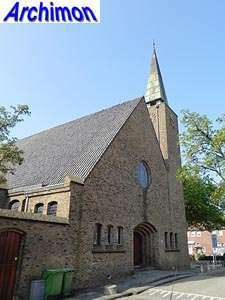 Church in Traditionalist style, designed in conjunction with T. van Hoogevest. 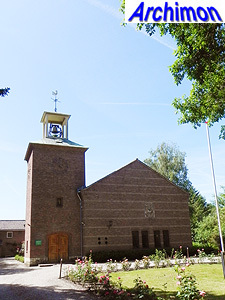 Church in Traditionalist style, with short tower. Designed in conjunction with T. van Hoogevest. 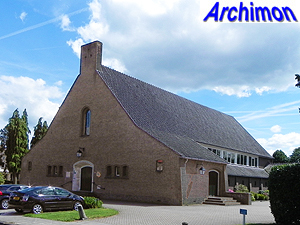 Church in Traditionalist style, designed in conjunction with T. van Hoogevest. Open tower.